The first book in the “Muffy” series introduces a number of captivating characters. Muffy is just a puppy and the smallest of the litter on the farm. She often gets left behind. To amuse herself, she plays a sort of hopping game with a grasshopper and leads herself way beyond the parameters of her farm. Familiar with the concept of a road, she finds one and follows it. Eventually, she comes on a house with a number of dogs and very welcoming humans. She makes herself at home, but misses her farm and her sister. Through one of the other dogs, she meets a dog catcher who can talk to the animals. This would be fun as a read aloud for younger kids. The characters are compelling and kids can help figure out how Muffy will find her true home. The illustrations of Muffy are beautiful and soothing enough for bedtime. For independent reading, the language and voice are a bit challenging so should be left to somewhat older kids. 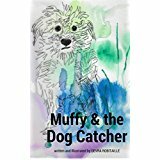 Kids will love the characters and will identify with Muffy’s struggles to fit in. They will enjoy getting into the minds of the dogs, as the dog catcher does. 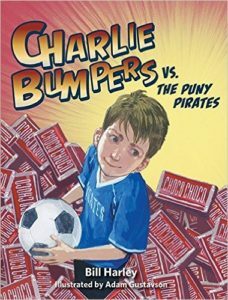 Charlie Bumpers returns in the fifth book of the series. When Charlie learns that he will be on the same soccer team as his two best friends, Hector and Tommy, they have dreams of being the Pirates of Doom. Instead, they have to learn to play with many kids who have never played soccer before. It’s all about team work. Steadily, the team improves, though it’s never the killer team of their dreams. Charlie also learns that the glamor position might not be the most rewarding. Meanwhile, Charlie’s older brother, Matt, delights in bugging him and embarrassing him as much as possible. Charlie, Hector, and Tommy attempt to sell chocolate bars together for a team fundraiser, which proves disastrous. They eat the bars themselves, give away bars on credit, and lose some of the money. Of course, everything comes out alright in the end, even though the boys must pay the price. 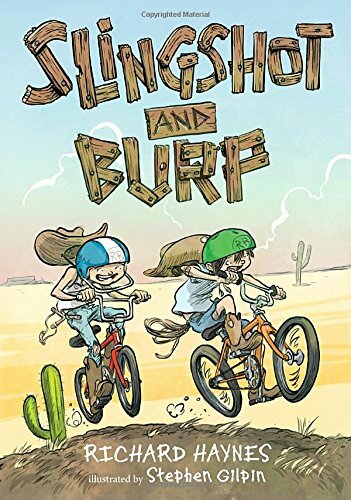 There’s enough action in this tale to keep kids interested and working on their literacy skills while also learning about working together and about responsibility. The true-to-life situations make it very relatable. Recommended for independent reading or for reading as a class for discussion. Two rootin’ tootin’ cowboys roam the Wild West in this cute tale brimming with fun and imagination. When double cousins strike out from the bunk house (play house) on their horses (bikes), they’re looking for adventure and a skeleton in the Boneyard. Their first stop is Big Jim’s Boots and Saddle Tack Shop for provisions and information. Big Jim is full of information, but we’re not sure how much of it is accurate. The boys discover their older sisters have taken over the bunk house and pink-ified it in their absence. The boys visit the Boneyard and find a skull and a spitting horny toad. They do not find the ghost Big Jim spoke of. Back at the ranch, they sleep under the stars and a cottonwood tree with a part-coyote pup. When the pup takes off, the boys are forced to search the Boneyard – at night and despite the Ghost Cat. They get lost and fall into quicksand (sort of). Of course, everything turns out right for the cowboys and Calamity Kate and Ma McKenzie. Action-filled illustrations accompany the fast-moving story and help explain the finer points. The reader would almost swear they’re in the Old West. Third graders, especially boys, will get a lot of enjoyment and practice with literacy skills from this premier novel. We can only hope for more from this team. After the Twin Towers fell on September 11, 2001, a steel beam was selected for recycling by the US Navy. The beam, weighing seven and a half tons, was transported by truck to a foundry in Louisiana. The steel became the bow of a new landing platform/dock (LPD), a type of war ship designed for a crew of 360 and transport of 700 to 800 troops. It was to become the USS New York. The shipbuilding itself was briefly interrupted by the devastation of Hurricane Katrina. 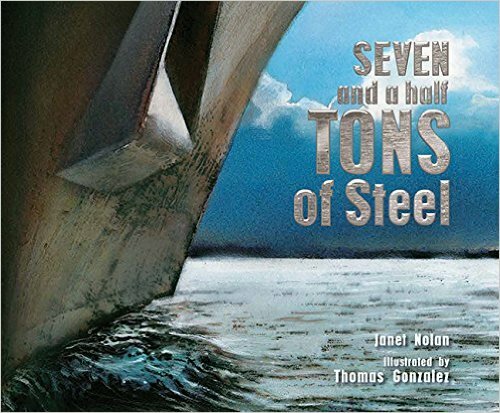 The ship then sailed the steel back to its home port of New York. The mixed media illustrations convey the solemnity of the story. Reading with a teacher or parent is highly recommended, as the text relies heavily on the recognition of symbols, many of which kids may not be aware of. An adult can explain how much the symbols mean. Throughout the story, flags drape the steel and the ship. A twenty-one gun salute greets the ship in New York. Statistics about the ship, as well as a detailed description of her crest follow the story. Even the diner on board is symbolic of the towers. 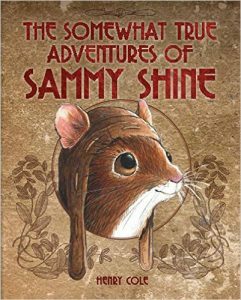 Sammy Shine is a warm and loveable mouse who lives in a shoe box in Hank’s room. When Hank’s brother, Jimmy, decides to test his new airplane design by sending Sammy into the air, the mouse’s adventures begin. He crash lands in the big woods and meets a family of wild mice, including Phoebe and old Osmund. Naturally, they are being threatened by a weasel and some rats, who want Sammy’s plane. Sammy also meets a mole, a crow, a newt, a shrew, and a raccoon. With his new friends, Sammy eventually gets the plane back in working order. He loves his new friends, but he also misses Hank and is afraid of the weasel. Cole’s beautiful and detailed pencil drawings are a big plus throughout this book. They have that three-dimensional feel that pulls the reader right into the action. Even the chapter headings are works of art. Though this is a simple and somewhat familiar story, these are characters a reader can care about and want to follow to the end. Third graders will learn so much about friendship and working together. Because the story holds the readers’ attention, they will get a chance to practice literacy skills. 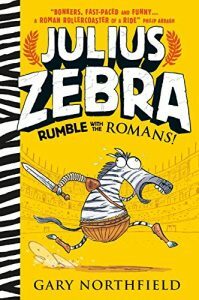 Julius Zebra: Rumble with the Romans! 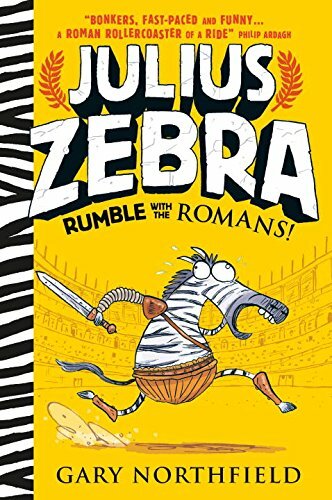 A fun and exciting way to explore the Roman Empire, this story about an unlikely hero will have kids wanting to be gladiators. Julius, a rebellious zebra, gets caught all alone at the local watering hole. When he is captured by Roman soldiers, he finds himself insulted, boxed, and transported a long way across land and onto a boat. He talks to and befriends other animals. Even the humans understand what Julius and the other animals are saying. Through a series of silliness, Julius is trained as a gladiator and is due to appear at the birthday celebration for Emperor Hadrian. There are a lot of details and terms that relate directly to the gladiator world, if you can weed out the obvious absurdities. The cartoonish illustrations add to the excitement and actually make this almost a graphic novel. Children younger than third graders would have fun reading this with a parent or teacher to learn more about Rome. An enjoyable read all around. 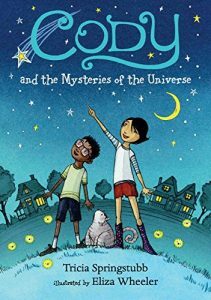 Loveable characters and a relatable plot make this, the second Cody book, a lot of fun to read. Add to that beautifully understated illustrations and you have a winner. Cody is trying to get a handle on the ways of the world, and that includes learning patience and acceptance. Her best summer friend, Spencer, is moving in permanently with his grandmother, GG. Cody finds that Spencer doesn’t always agree with her nor does he want to spend all his time with her. He spends a good deal of time with a third friend, Pearl, who has agreed to accompany his violin with her piano. Even when they’re together, Cody and Spencer must deal with the evil Meen neighbors, who seem very angry about something. Then there’s the Spindle, or Mrs. Spindle, Spencer’s new teacher who Cody dislikes and Spencer adores. A good feature of this story is that it’s subtly diverse in a variety of ways, but the characters mesh well. Spencer is black, loves classical music, and plays a violin. Cody is white, relates to pop music, and has a truck driver father. Pearl does origami. The neighbors love tattoos and spiked hair. Kindred spirits are hard to find. Friends who truly believe in you and your dreams are just the kind we need. 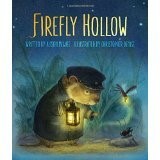 In, Firefly Hollow, there is a whole nation of fireflies, but only one that wants to fly to the moon. There is a whole nation of crickets, but only one that wants to catch baseballs. Good thing they find each other. Even better, they find a miniature giant who really, really needs friends. This beautiful book reminds readers of, The Wind in the Willows, with its exquisite illustrations done on glossy papers and with no text on the backside of the page. In some ways, it will also remind children of the Ice Age stories as these friends: firefly, cricket, and miniature giant form a nation of themselves just as the characters in Ice Age create a new kind of herd. What is most important is how each of them understands, supports and fulfills the needs of the others. Peter, the miniature giant, has lost his best friend and doesn’t know how to cope. Readers will understand these feelings whether they have experience the death of a friend or had a close friend move away. The animals understand Peter much better than his parents do. The readers will pick up on the connection between the river vole and the father as a particular secret they hope will be revealed. 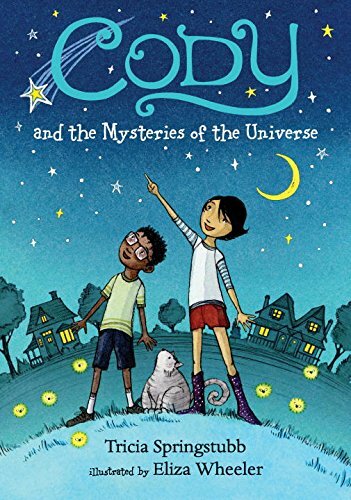 Middle grade readers will enjoy this as an independent read, a read-aloud or a book club discussion title. Literacy core curriculum standards will be fulfilled in several areas using this book, and it is definite the art teacher will want to do a unit revolving around these marvelous paintings. Writing standards can be met as students branch off after this reading to write their own stories about kindred spirits, actual friends, or unspoken dreams. Ever been an outsider? Remember what that feels like deep in your soul? Nate and Genesis are both outsiders. They stick together because, “weirdos and losers stick together” and that’s their motto. Nate is just downright unlucky. All the time, everywhere unlucky. Genesis is a brainy girl who doesn’t believe in luck. She believes in science and probability and such. Even when Nate doesn’t call the right coin in fifty-four tries! In a fun and opposing way, Nate is the complete opposite of Harry Potter. He does get struck by lightning and becomes the luckiest guy in touch. Townspeople even start saying he has the Midas touch. Everything is fantastic, the cool guys want him to play baseball with them, all the fishermen want him to ride on their boat. Until Nate realizes they don’t want him, just his luck. This is a great story about being outsiders, what real luck actually is, and loyalty to the end. Grade four, grade five and grade six readers will enjoy this story on every page. The realistic use of dialogue and short sections makes it easy to read quickly. Some students may enjoy reading parts aloud as they act out certain sections. 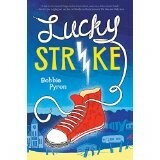 Teachers and librarians can use it as an excellent example of: voice, character development and plot. They will fulfill the core curriculum standards in literacy and English. It is recommended for all elementary and middle school and public libraries. Would you set a faerie free? How about a trapped orphan boy? Open the pages of this adventure book based on Gulliver’s Travels, and go along with three inch high, Lily, and the captured boy, Finn, as they rescue each other. Supposedly, on Gulliver’s first return from his travels, Londoners called him a liar and lunatic for talking about lands with tiny people. So, on his second trip, he captured a tiny faerie to bring back to London as evidence. This is her story. Short chapters, plenty of dialogue and good humor help the story to move along at a comfortable pace. Young independent readers will delight in the story. Teachers, librarians and parents will enjoy the literary quality of the work, as well. London in the 1800’s is well represented in details of sight and smell. Friendship in all its trials and glories is explored as Finn and Lily struggle to free each other. Their adventure is one of twists and turns, failures and successes. Realistic pen and ink drawings bring the characters, as well as the surroundings of the city of London to life before the readers’ eyes. Art teachers and librarians can use these drawings to begin discussions about illustrating a story. Teachers and librarians can introduce this story with or without comparisons to the original, Gulliver’s Travels. Maybe it will piggy back with, The Borrowers, Stuart Little, or other such stories about the unseen little people of literature. Perhaps this will be the introduction for some students into the world of fantasy. Standards in the core curriculum for middle school literacy will be satisfied. Grade four, grade five or grade six readers will enjoy this immensely. This book is recommended for all school libraries and it would be a wonderful present for fluent as well as reluctant readers.